A post, finally. We have been home a single weekend in the past six weeks, and on that single weekend, we had guests in town. Needless to say, it’s been tiring. But now we’re home (home! ), not working, and chilling. Cooking. Cleaning. Seeing friends. Enjoying. We’ve been traveling nearly every weekend for weddings and for fun. Wisconsin, Chicago, the Hamptons, DC – we’ve made appearances in a lot of our old favorite joints and some new ones as well. But all the time away has taken its toll – our cats are starved for attention and our fridge could use some restocking. So this weekend included plenty of cuddle time and cooking. I’ve been making something similar to this salad even on busy week nights. It’s easy, it’s cold, and it’s light – perfect for summer. A variety of vegetables would be great in it. Tofu as well. The hardest part is making noodles out of cucumber and zucchini, but you could slice them any way you want, really. What makes it Vietnamese is the dressing – a version of Nước chấm, a slightly sweet, salty, and sour sauce common in Vietnam. 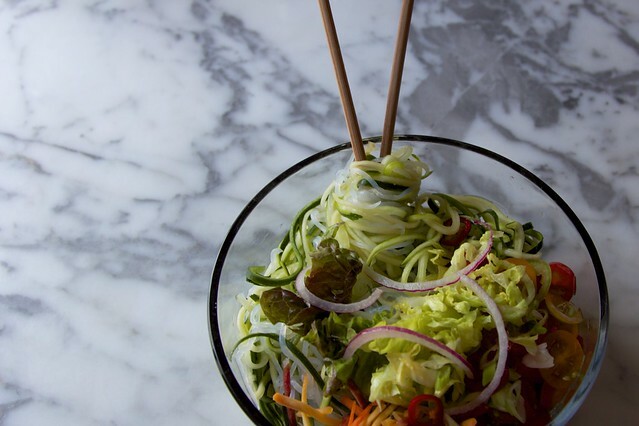 The shirataki noodles – they’ve been a favorite as of late, largely because they require virtually no work. Open, rinse, done. No cooking. No heating. Start by preparing the dressing. Mince the garlic, ginger, and serrano and put them in a mason jar or small bowl. In a pot, heat the fish sauce, rice wine vinegar, and sugar and stir until combined. Pour the liquid over the minced garlic, ginger, and serrano. Let sit in the fridge until ready to use. Next prepare all the vegetables. A julienne peeler is very useful in this case. There are some cheap ones on Amazon, but I’ve found it worth the investment to go with a slightly higher quality one. Salt the veggie noodles and let them drain for 5 minutes or so. Rinse the shirataki noodles very well under cold water, then combine with the veggie noodles. Rinse the whole batch one more time under cold water. 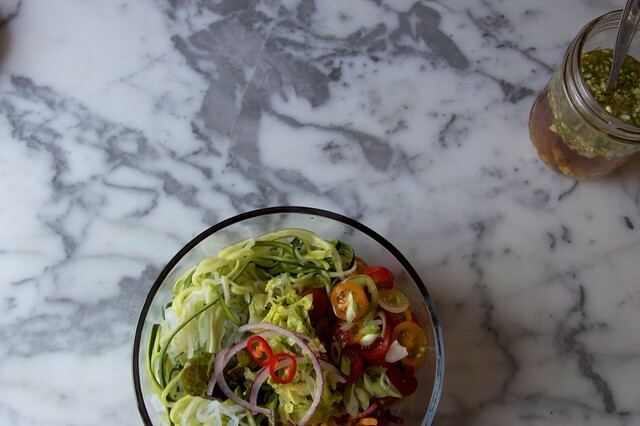 Toss everything together with the dressing and serve cold.